Failing to use those taxes to improve infrastructure, and therefore their economy. If you noticed that “making good beer” did not show up on that list, then congratulations. You’re smarter than you look (and Mr. Sixpack, that makes you much, much smarter than you look). I dove into 3 less-than spectacular Canadian beers in a recent trip, starting with an old standby. While this may be anathema to utter amongst my Boston-bred brethren, Sleeman is essentially Sam Adams: Canada. Both started out in the 1800s. Both went out of business sometime in the mid 1950s. Both were revived in the 1980s by descendants of the original brewmasters. Both are currently producing large quantities of beer, in a variety of styles, with the most generic names you’ve ever heard in your life (Dark, Light, Cream, Honey Brown, Original, Clear, Rousse, Porter, IPA, Bock…Sleeman’s most creative beer name is “Silver Creek,” and even that sounds generic). Compare that list with Sam’s varieties, and you see what I mean. Though unlike Sleeman, Sam hasn’t been bought out by Sapporo. Yet. Anyway, I don’t have a palate nearly as refined as Brother Barley’s, nor do I have the preternatural ability to describe beer the way he does. But I’ll say that the Original Draught is a golden lager, smells like a golden lager, and tastes just like a golden lager should. Nothing fancy, it’s a blue collar beer with limited taste and little aftertaste. Something about the mouthfeel is silkier than other Canadian mass-produced lagers (especially the two bigger in-country rivals: Molson and Labatt’s). One reason for this, perhaps, is that the water around Guelph, Ontario, where Sleeman is headquartered, is reputed for being amazingly clear and clean. If that’s true, it’s not surprising that the beer would benefit. Still, we’re talking about a mass-produced lager from Canada. I give it 2 hops. Being slightly better than Molson isn’t anything to be proud of. Right, Brother Barley? 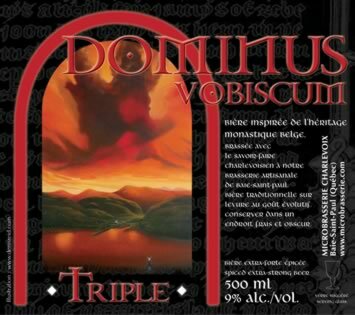 On my honeymoon was when I first stumbled upon Dominus Vobiscum, crafted by the Microbrasserie Charlevoix. As a general rule, whenever you can get a microbrew along the northern shore of the St. Lawrence River in the Middle of Nowhere, Quebec, you jump at it. I remember being pleasantly surprised by their formidable Ambree Belgian Pale Ale–a perfect beer for sitting on a deck chair and spying pods of beluga whales. Unfortunately, while down in Montreal last week I couldn’t find the Ambree, so I went with their Triple instead. Mind you that this is not my favorite style, so it takes a good Triple to win my appreciation. Sorry to say that the Dominus Triple experience was not a fond one. Maybe I got a bad batch, but this beer left a cloying bitterness and alcohol burn on the palate that lasted much too long. The taste was all over the place: nothing cohesive and complex, just a taste battle gone ugly. I had to struggle through this one, lest I look like the Bitter Beer Face guy from the old Keystone Light commercials in front of my in-laws. I will have their Ambree any day of the week. But the Triple is a 2 hop beer for me. God in Heaven! 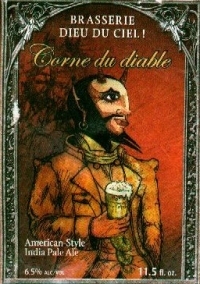 : Devil’s Horn is an attempt at an IPA that hits some wrong notes along the way. While the Dieu du Ciel brewpub in Montreal actually makes a ton of great beers (many of them cask-conditioned), their manufacturing facility in Saint Jerome produces this selection. If you’re expecting a generously hopped beer with hints of spice and grapefruit, as you would in most IPAs, you’ll be sorely disappointed. Malt rules the day with this IPA, overpowering the hints of hops that I love so well in IPAs. I look forward to tasting their other selections, but its lack of balance just didn’t impress this alehead. 2.5 hops from me. So, I suppose the moral of the story is: don’t go to Canada (although I wouldn’t be surprised if there were some better breweries out west in BC). Or, if you must go to Canada for some reason, find yourself a smoke shop, load up on some fine Cubans, and enjoy your whale watch while puffing on quality tobacco. Posted in Beer Culture, Tasting Notes. You won’t hear me arguing in favor of Molson…and certainly not Labatt or Sleeman. The parallels between Canada’s “Big Three” and their American counterparts (BudMillerCoors) are eerie…right down to their recent buy-outs by foreign companies. If you really want an analogue for Sam Adams, try Moosehead…the largest wholly Canadian-owned brewery. I’m indifferent to Canada as a country (I suspect indifference is the most common way Americans would describe their feelings regarding our neighbor to the North), but I truly despise their beer. Beyond the fact that their macrobrews have a ridiculous stranglehold on the beer industry in Canada (Molson and Labatt actually own shares in many major package stores), I’m not even that crazy about their microbreweries. Unibroue is probably the most renowned Canuck craft brewery…and I honestly can’t think of a single beer they produce that I enjoy (though their Terrible is, ironically enough, actually not terrible). That said, my knowledge of Canadian microbrews…particularly those on the West Coast, is abysmal. So I’m very much looking forward to reading future tasting notes from our Canuck-loving cohort, Mashtun. I’m a big fan of Unibroue, especially the Trois Pistoles and the annual release of the Unibroue “Insert Current Number Here” Belgain Strong. I think they’re up to Unibroue 17. Maybe the next Aleheads consortium should be at the Mondial de la bier (http://festivalmondialbiere.qc.ca/en/festivals/mondial_de_la_biere_montreal_2010/). It’s supposed to be epic and I’m pretty sure Montreal has a couple other interesting things on offer aside from poutine. I done love me some Alexander Keith’s. How else are you supposed to spend your PEI winters other than blowing your unemployment checks on bad beer (and gasoline for your snowmobile)? Haven’t sampled anything from Unibroue, though I see their products all the time. I’ll have to pick up a 6 pack when I’m up there in July. I agree. We could do some serious damage at that beer festival. Too bad it’s next week. Victoria and the West Coast of Canada are in a different dimension than the rest of Canada and that applies to beer as well. I’d rank Phillips and Driftwood beers as good as or better than anything out of Oregon, Washington, etc. You arrogant douchebags. All we’re good at is smoking, drinking and paying taxes. Good thing you guys never drove up here. There’s over 40 microbrewerys in Quebec and you manage to review Sleeman??? “If you noticed that “making good beer” did not show up on that list” and than “Dieu du Ciel brewpub in Montreal actually makes a ton of great beers”. That review Sucked A$$. At least we’re good at keeping our country economically healthy. And Whale watch really, in Montreal? Common man, it’s a 4 million people city not even near the ocean. At least you could’ve said women watching, cause that’s something you guys lack, beautiful women. I have to agree, to some extent, with the sentiment from VeZ. It doesn’t seem like any effort was made to review any of Canada’s good micro breweries. I’ll respectfully disagree with your review of the Dieu du Ciel. 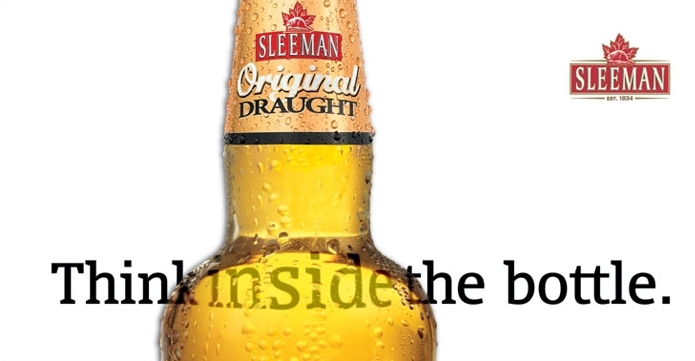 But even reviewing Sleeman’s seems completely inappropriate. Wouldn’t surprise you? The growth and quantity of excellent breweries is well known to everyone in Western Canada and in the Pacific Northwest. As a writer for a well known beer blog, how could you not know that already? My Canadian friends…I can assure you that Mashtun wrote this post with his tongue planted firmly in cheek. His lovely wife comes from your fine land and he gets a significant amount of mileage in his relationship from mocking her heritage. 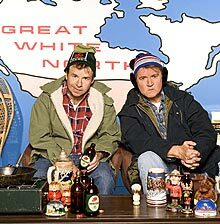 All of the Aleheads have fond memories of our frequent visits to Canada (particularly road trips to Montreal during our college days). It’s just that making fun of Canada is a bit of a cottage industry in the US…made all the more amusing by the fact that, if you look at most metrics, you’re actually doing quite a bit better than we are right now. Anyways, I insist that you keep calling Mashtun a douchebag (we do all the time), but please know that we love our neighbor to the North and this post was mostly meant in jest. That said, none of us have had the opportunity to truly explore the West Coast Canadian microbreweries and we’d LOVE some recommendations from our readers. No sweat…jabs at Canada are, usually, appreciated by Canadians. I think the confusion was more about the ales that were reviewed. It seemed like an odd selection. I’d love to see another review that covered a wider range – but, yeah, a trip out West isn’t free. In any case, it’s crazy what’s going on in Victoria, BC right now. Seems like there’s a new brewery or brew pub opening each month. I thoroughly enjoyed some Central City Red Racer a while back, I can at least volunteer, coming from somebody who’s never been over that border. This was the selection my mother-in-law had in her fridge that day. I drank them. And rather than hang out with my in-laws, I decided to write. Thus, the odd combination. Believe me, it was all in the name of drinking and avoiding crazy people. And drinking. I finally made it to Dieu du Ciel a few months later. You can find that write-up here https://aleheads.com/2011/04/21/giving-it-its-dieu/. I believe it when you say that there are great microbrews in Quebec, but I’m wondering if you find the distribution laws as frustrating as I do. Every time I’m there, I look for these elusive microbrews, but can’t find them anywhere. Not at the SAQ, or the grocery store, or even at the markets. If you know the names of any great beers and where I can get them, I’ll be happy to extol their virtues on these pages. Same goes for British Columbian beers that are distributed out East (though I doubt you can find much). As for the whale watch, I did say that happened up in the Charlevoix (near Saguenay), where the St. Lawrence is extremely wide and the krill are plentiful, attracting belugas, finbacks, humpbacks, and even blues. But you’re right about the whale tail in Montreal…I enjoy ogling that as much as any red-blooded alehead.